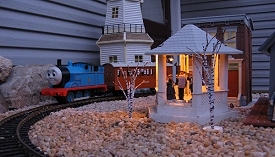 On November 8, 2008, we held our first-ever Christmas-themed open house on our garden railroad. I kept a "blog" of sorts to let other folks know what it takes to put on this kind of thing. Lots of fun, but lots of preparation as well. This is the fifth, and presumably last installment in the series. Part 4 covers the last thirty-six hours of preparation, right up until people we didn't know started up the driveway. Running trains, and keeping an eye on them to make certain they were operating. Welcoming visitors, answering questions, and offering literature and snacks. 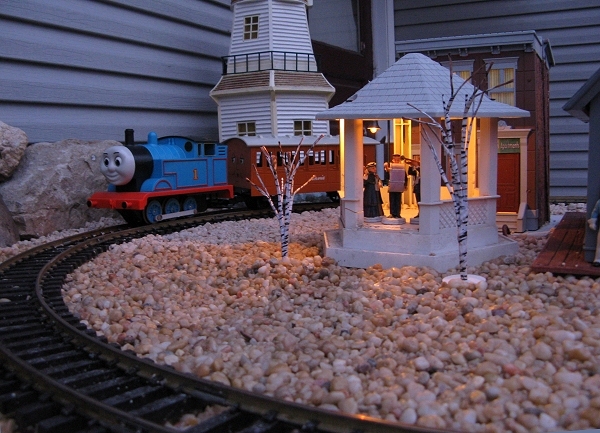 By the time folks started arriving for the open house, we had all the lights lit, all of the people and accessories set out all over the railroad, trains on the track, literature on one table, cupcakes and lemonade on another, signs in the front yard, and Christmas music in the air. What more do you need? Nice weather, I suppose. The weather was a bit damp at first, then it dried up and turned cooler, then it turned cold. This shouldn't be a surprise for November 8, but we had had shirt-sleeve weather just a few days before. For the first two or three hours, it was nice enough to stand around a while, and many people did. But by the time it became dark enough to see the beatiful Christmas lighting and the warm glow from the windows of the little houses, it was getting too cold to stay out long unless you had your full winter gear on. Denny Lamusga, whose own garden railroad is three or four times the size of mine and very nice. Denny came early and took a look at a Pacific I've been having trouble with. He stayed to chat with visitors for a time. Two other families who are just getting started, including a fellow who I know from another context - this is the first either of us knew the other was interested in garden railroading. The Halls, a nice couple who had an open house for their HO railroad earlier in the day. Nick Folger, the fellow who organizes open houses for the Dayton-area NMRA chapter (National Model Railway Association) was there as soon as we put out the sign. He took his time looking things over and asking questions. He also thanked us for having an open house; we were the only garden railroad on the "tour" this year. Several friends of the family, mostly from our church or from the Tecumseh school district, also stopped by. The rest of our visitors came around because they had seen the notice in a handout at the Dayton-area NMRA club's train show at Hara Arena a week earlier. Several of those families and individuals were interested in starting garden railroads and had lots of questions. Some questions were very basic, like, "does the track really stay outside all year?" and some were pretty complicated, showing that folks had been reading up and thinking things through. I hope we were an encouragement to everyone who attended. Surprisingly we only had a few small children - usually open houses bring out the families with children. Maybe the cool weather and the predictions of colder weather kept some families from heading our way. As alluded to in section 4, we started out small, running an 0-4-0 on the "big" right of way until we were sure it was safe for bigger trains. Eventually we settled on running our largest engine, an AristoCraft Mikado on the that track, pulling three Aristo lit Sierra coaches. The picture to the right was taken from a photo by Jerry Humston. To see Jerry's original photo on the MVGRS weg site, click here. 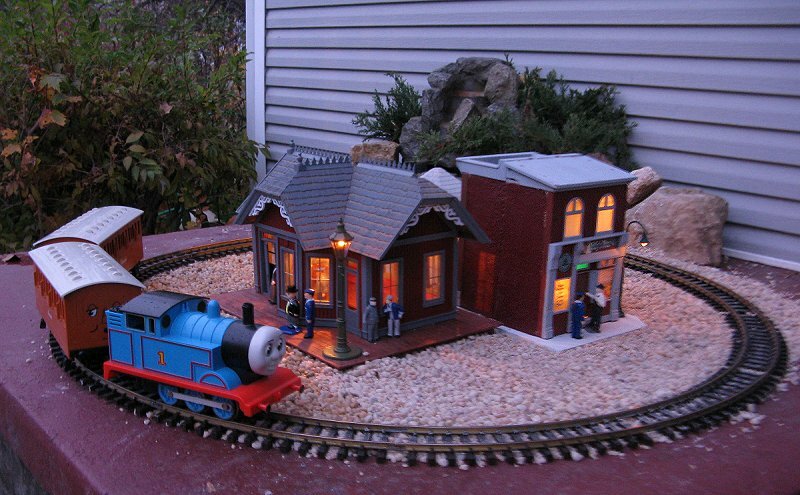 We also had a Thomas the Tank Engine and James the Red Engine that we planned to run on our well cover, a 5'x5' slab of concrete on the back of the house. As it turned out, we had relatively few young visitors, so we didn't wind up swapping Thomas and James out like we've done at other events. A Bachmann closed streetcar that is decorated for Christmas ran most of the day on the lower loop. We also fed people cupcakes - Shelia had made three different kinds and Kristen had iced them beautifully. I handed out literature and answered questions and collected "sign-in"s from most groups of visitors. I also told several folks to look me up in the spring and get free groundcover starts, especially sedums. I had told folks that the best time to come would have been around 5:00 - that way you could see the railroad in daylight and stick around to see it lit for Christmas. Once the lights came on, the effect was dramatic, but the weather was cool. I kept watching out the window for visitors, and watching the trains. I was right about how cool the lit coaches looked circling the upper track, by the way. One family did show up at dusk, but they were folks we hadn't talked to ahead of time. By then it was cool enough that they said something like, "Wow, this is beautiful. Thanks for having this. We're going back to the car now." All told, we had maybe sixty folks stop by, including several from church, a few from the Miami Valley Garden Railway Society, and many who had seen the notice in the NMRA handouts. Although it doesn't beat our best warm-weather open house ever, it is about six times as many people as we had turn out on our first cold-weather open house. I don't know how many people would have stayed longer if there was more to see, but I think some kind of tent or pavilion with two or three sidewalls to break the wind might have been helpful. You may feel I've provided far more detail about our preparations than I needed to, but I just wanted to show the "worst-case" scenario - taking a railroad that barely functional into the best shape its been in five years, and adding Christmas lighting and accessories on top of that. 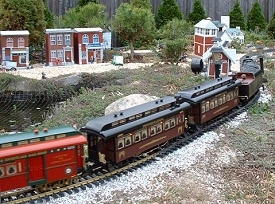 Like our New Boston and Donnels Creek pages, we wanted to show that even chronically disorganized people can have a great garden railroading experience with a little hard work and willingness to try something new. Above all, we wanted to give you ideas and encouragement for your own Christmas season, whether it involves trees, trains, cupcakes, or anything we've mentioned at all. Please accept the Race family's wishes for a joyous Christmas and a blessed New Year! 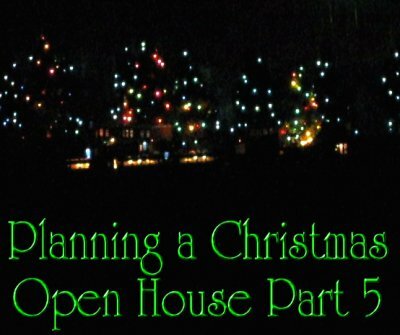 Once again, if you would like to ask questions, be notified of future open houses on the New Boston and Donnels Creek, or learn about other Christmas-themed open houses in Southwest Ohio this year please visit our 2008 Christmas Open Houses sheet. To return to Part 4, click here.